In a postcard-perfect valley in southern Norway, Annemor Sundbø nurtures her life’s work: old garments, paintings, and other clues to the myths and meaning woven into Norwegian sweaters for centuries. Now she’s trying to bring back the sheep that used to sustain this time-honored craft. The Setesdal valley was once quite remote from the more populous Norwegian coast, with access to its interior possible only by means of a network of trails and footpaths. Today, the region’s unique culture preserves traditions in dress, dialect, poetry, and music that go back to the middle ages. Several years ago, my husband and I were traveling south along Norway’s Otra River, heading down from a family cabin in the Setesdal mountains toward the southern city of Kristiansand, when we detoured for groceries at a tiny roadside village called Ose. Lying on a flat valley floor, the village is framed by steep mountains that are often wreathed in clouds and fog. Until the middle of the 19th century, it was the last navigable stop on voyages upriver from the coast; journeys beyond the village could be managed only on a network of trails and footpaths that provided access to the Telemark valley to the east, and Lysefjord and the coast of Norway to the west. Setesdal is dotted with small log storehouses raised on stilts with turf roofs. Called stabbur, or stolpehus in the local dialect, they were used to store a farm’s valuables, including the garments and silver that make up the traditional costumes. The oldest of these storehouses date back to 1350. photo of Tradisjonsbygg ved Ose by Anders Martinsen for VisitNorway.com. Ose is marked by a century-old hostelry that still accepts overnight guests and a scattering of traditional log storehouse buildings, built on stilts with sod roofs, which are a local signature. In the middle of this tiny complex was a much older building, two stories high and constructed of enormous, ancient logs. A sign said it dated back to the 17th century. Along with her sweaters, Sundbø collects vintage tools, such as 19th century domestic knitting machines and bobbin winders. Knitting machines, also called stocking weaving looms, were used by cottage industry knitters as early as 1800. The door was invitingly ajar so I wandered in to explore and discovered a surprising display of ragged Norwegian sweaters. I couldn’t discern the meaning of the unexpected exhibit, which had nothing to explain itself in English, so we wandered next door to a wood-frame building that housed a small crafts shop filled with wool and knitting and myriad wooden tools. In a stroke of luck, the proprietor, Annemor Sundbø, was in her workshop, which is open only intermittently, and she was happy to talk. I left with some books and a nagging desire to understand what this was all about. Until this spring, Annemor Sundbø’s salvaged sweater collection occupied the second floor of Storstoga. Her “rag-pile” has now been moved to the Setesdal Museum for an exhibition on her life and work that is scheduled to remain up for two years. Last summer I visited again, and this time I climbed the narrows stairs of the ancient log building, called Storstoga, with Sundbø serving as my guide. On one side, the wall was covered with framed news clippings and advertisements for mid-century Norwegian sweater patterns. There were photos of 19th century locals wearing traditional patterns from the countryside. There were news articles about the famous Marius sweater, derived from the traditional Setesdal pattern and modeled by the skier Marius Eriksen, who wore it in a 1954 film called “Troll i Ord” that catapulted the design into international popularity. (Marius was the brother of the legendary Olympic ski champion Stein Eriksen, who also wore variants of the famous pattern and helped popularize Scandinavian sweaters among skiers worldwide.) There were also articles about Sundbø herself, with photographs taken of her decades ago in the Torridal Tweed factory, which she then owned. In 1983, Sundbø asked a local mill owner for permission to study weaving on his industrial machines. Instead, he sold her the mill, which was named Torridal Tweed og Ulldynefabrikk. With it, she acquired 16 tons of cast-off wool sweaters, socks, mittens, and underwear destined to be recycled into wool-filled comforters, pillows, and rag rugs. The real treasure, however, were dozens of hand-knit traditional sweaters, organized by pattern so that you could see how they had been modified by individual knitters. Upon close examination, you suddenly noticed details, like how the iconic eight-pointed stars were treated differently sweater by sweater, and valley by valley. “The biggest star, that you got only after confirmation,” she explained. “The star was protecting, the leading star. It should help give you good luck on the way.” This star, which is also known as the Selbu rose and is found in the distinctive mitten pattern from a Norwegian town called Selbu, is an ancient symbol found in numerous cultures. In Norway, Sundbø said, even before the advent of knitting it was frequently woven into coverlets and nightshirts to offer protection in the night. Hanging on the walls were multiple worn versions of the famous Setesdal sweater, probably the most recognized design within and beyond Norway. It is marked by a distinctive “lice” pattern of white dots knit into a contrasting black background, and a neckline framed in colorful embroidery called løyesaumen and secured with a silver clasp. The Setesdal sweater is one of the Norwegian patterns most closely identified with a particular place and tradition, and Sundbø has become the country’s most respected expert in the cultural history of this design. Until the Middle Ages, the process of turning wool fiber into yarn was done on by hand, using a whorl-weighted stick called a spindle. Although dates are uncertain, it is thought that spinning wheels originated in India and arrived in Europe in the late 1200s. Into the middle of the 20th century, wool in Norway was valuable enough that sweaters were worn to the end of their time, then unraveled or shredded for reuse. This deeply worn Setesdal-pattern cardigan tells a story of rural poverty and hard work. Sundbø’s rescue of the sweaters launched a lifetime mission to discover, document and preserve the craft of artisanal Norwegian knitting while it is still in living memory. In valuing handmade work when the rest of the world was falling in love with industrialization, she was well ahead of her time. In a sense, she follows in the Norwegian tradition of the 19th century folktale collectors, Peter Christen Asbjørnsen and Jørgen Moe, who preserved local stories and dialects before they vanished, and Johannes Skar, who wrote eight volumes about folk culture in Setesdal, the valley where Sundbø now has her workshop. She has interviewed the oldest women and men she can find in remote Norwegian enclaves to find out what they wore, how they were taught to knit, and how they learned patterns. She has identified symbols that date back to pre-Christian mythology, and which tell stories that even the knitters no longer understand. She is a magpie, ferreting out historical clues in fairy tales, Viking sagas and burial mounds, etymological traditions, old paintings, vintage postcards, and even in the remnants of knitted sweaters used to insulate 19th century houses. She once traveled to the Red River Valley in Minnesota to seek out the descendants of Norwegian emigrants who might have brought and preserved their traditional sweaters. Sundbø has written six books that document the cultural heritage of Norwegian knitting and textiles. One, “Invisible Threads in Knitting” (2005) won Norway’s Sørlandet Literature prize. A seventh, called “Koftearven, historiske tråder og magiske mønster,” is forthcoming in May from Gyldendal, Oslo. The books do their own share of weaving, bringing together a montage of stories about motifs, symbolism, folk beliefs, historical context, and technical invention. Her work, she says, explores the interaction between spirit, hand, and tools. Annichen Sibbern began collecting knitting patterns in 1927, and her pattern book, “Norske strikkemønstre” is considered the bible of Norwegian knitting. Women’s weeklies were also a popular source of patterns; soon most knitters preferred using a pattern, which helped traditional designs survive and become classics. The intensity of Sundbø’s obsession is contagious. She is nearly 70, with a short, practical bob of white hair, vivid blue eyes, and a smile that illuminates her face and immediately draws you in. In conversation, and in her writing, Sundbø makes it clear she is undaunted by academic experts, and unfettered by canonical precision. She gathers material widely and makes hypotheses that are radical, but she doesn’t cling to these ideas. She merely points to surprising and unexpected ways of considering a problem, and asks, could it be so? And then she laughs her big laugh. Today, Sundbø says, we consider crafts like knitting or weaving to be skills, embodying techniques that can be learned. We may even concede that art is involved, by which we mean that the work involves imagination, creativity, and inspiration. But Sundbø argues that even these definitions are missing something. In ancient times, she posits, textiles and the stories woven into them embodied a direct spiritual transmission from the maker to the recipient, a transmission that was both a literal and a figurative form of protection from danger and evil. Sundbø found this 1935 Christmas postcard, by the renowned illustrator Trygve M. Davidsen, in an abandoned house in Setesdal. Davidsen’s detailed paintings usually depicted traditional colors, but this illustration doesn’t show the sweater’s iconic black and white pattern. Sundbø believes the artist painted it from a variation he had seen. By painstakingly recreating sweaters from details in paintings and illustrations, Sundbø gets inside the minds of the people who knitted them. Her work also allows people to visualize sweater designs before the advent of color photography. The man on the right is wearing the sweater Sundbø recreated from the Setesdal postcard above. A well-spun thread was not only even and strong, it also carried the spinner’s spirit. So, too, with a well-woven garment, which Sundbø believes delivered a blessing encoded in every aspect of its creation, from the gathering, carding, and spinning of the wool to the weaving, knitting, and embroidering of the final garment. Women were the ones who did all of this work; as such, Sundbø argues, they wielded immense power. By the 20th century, most of the designs being knitted by Norwegian women included symbols that reached back to ancient times, but whose meanings had largely been lost. Sundbø has dedicated her life to resurrecting and documenting as much as she can; meanwhile, she does her own spinning, dyeing, weaving, and knitting, deepening her understanding of the possibilities of wool and hoping to inspire others to respect its power. Sundbø’s eclectic and daring approach has generated plenty of attention in the knitting world. 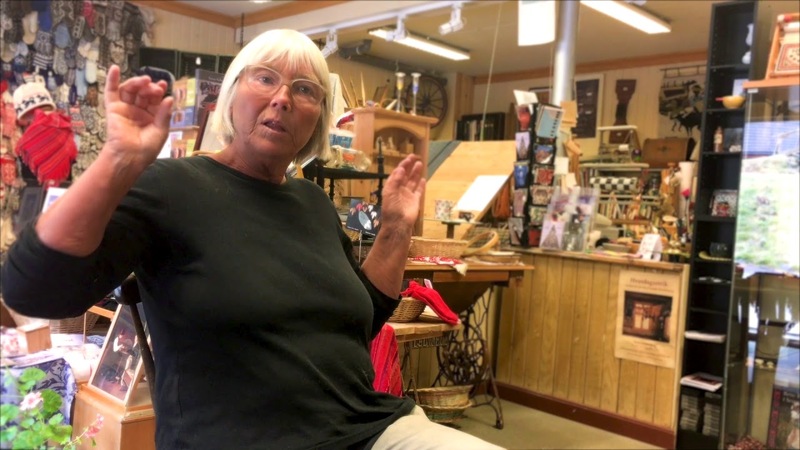 “She’s the only person to do this work,” says Robbie LaFleur, who publishes the international Norwegian Textile Letter out of Minnesota. A former student, the textile artist Inger Johannes Rasmussen, says Sundbø is a craftswoman with extensive skill “in her fingers.” Yet what impresses Rasmussen most is Sundbø’s detective skills. “If she sees something in Morocco, and she sees something in Turkey, she connects, digging deeper than most people. She has a fantastic ability to follow small clues. By this point, Sundbø has taught and lectured all over the world, and many of the sweaters and stockings and undergarments from her rag-pile collection have traveled with her. One sweater graced the cover of a fashion magazine in Japan, and her mittens were shown at the Nordic Heritage museum in Seattle. Another tattered sweater was used for an art project that drew international acclaim, making the British artist Celia Pym a finalist for the 2017 Loewe Craft prize. Twenty-five years ago, the Setesdal museum put on an exhibit of her salvaged sweaters; a comprehensive exhibit of her life’s work will open at the museum in May, which will include her collection from Ose. The two-layered wool on spelsau sheep is revered by crafters. The inner coat is light, soft, and warm, whereas the outer coat is glossy, durable, and water resistant. Sundbø has joined with several others to raise a free-ranging flock on an island called Bragdøya, off the southern coast city of Kristiansand. One of the most distinctive and recognizable Norwegian sweaters is the lusekofte or “lice-pattern sweater” of Setesdal. The oldest sweaters had a wide white section at the hem. Torridal Tweed og Ulldynefabrikk was the last shoddy mill standing in Norway, and with it she also acquired 16 tons of cast-off wool sweaters, socks, mittens and underwear destined to be recycled into wool-filled comforters, pillows, and rag rugs. The woolens were 30 to 100 years old, and as she began sorting out those to be thrown away, she realized she was holding in her hands the creative labor of thousands of ordinary women. As she began saving those that offered clues about traditional patterns and their variations, she recognized there was a whole story in ordinary knitting, one likely to be lost because it was considered so mundane. The Setesdal valley is an insular enclave of ancient, well preserved folk culture. It’s no surprise, then, that Sundbø’s rag-pile led her to write the definitive history of the Setesdal sweater, a book that has all the hallmarks of Sundbø’s unusual research process. Originally, the Setesdal sweater was a pullover only worn by men. Sundbø discovered that the cardigan version was created early in the 20th century when she happened to meet Setesdal artist Harald Lund at a dinner party thirty years ago in Kristiansand. Lund, born in 1908, was then in his 80s, and he told her a story about how he’d never particularly wanted to dress in the traditional folk costume but had wanted to use the folk art of Setesdal in his own way. So he designed a cardigan version that he says caused people to stare in astonishment. Sundbø learned about the color qualities of native lichen from her grandfather, who was her earliest teacher in the art of dyeing wool. One good lichen source is the boulders that lie just down the path from her Ose workshop. Sundbø also tracked down and interviewed the late Jorunn Rysstad Fjermestad, who she had heard was the first woman to ever wear the traditional lice-patterned sweater. (Sundbø acquired a black-and-white photo of Fjermestad from about 1935, in which she’s sitting on the ground high in the Setesdal mountains, wearing a beautifully crafted version of the sweater.) By the 1960s, the sweater was internationally famous and worn happily by both genders. Sundbø remembers school-girls in Kristiansand knitting the sweaters with their hands hidden beneath their desks. Until the mid-19th century, the løyesaumen – the distinctive embroidery that trims the sweater’s neck and cuffs—was made from soft vegetable dyes, which created rather muted colors. After artificial dyes were invented the embroidery colors became more vivid. Today, you can buy cheap imitations of løyesaumen; Sundbø just wants to be sure you realize the yarn in these commercially manufactured embroidery strips, and the sizes of many pattern elements, are often inauthentic. Sundbø has been experimenting to develop shades of blue dye from the tiny glands of Norwegian mollusks called dog whelks (Nucella lapillus), which she gathers from tidepools by the North Sea. After she processes the glands in a multi-stage method similar to one used for plant dyes, the substance turns the wool sapphire blue. About 25 years ago, Sundbø moved to Ose from Kristiansand. At the time, a local movement to value the region’s unique folk culture was just gaining sway, and a friend thought she would be a good addition to the burgeoning folk-art community. She bought the abandoned grocery store across the street from a workshop where local women sewed and embroidered their bunads. (Bunads are Norwegian costumes with distinctive regional variants that take a year to make by hand. They are worn today as the most formal attire one can display at weddings, funerals and meetings with the King.) Sundbø fell in love with Ose, and with a local farmer, and built a life there, though she still also maintains a studio and home in Kristiansand, the port city at the mouth of the river where she spent her childhood. In 2011, archaeologists surveying for a road improvement project unearthed a significant Viking-age burial ground in Langeid, just a few kilometers up the river. The 30 graves included an unusual ornate sword, a broad axe, and other weapons. But of more interest to Sundbø, they also contained everyday tools such as textile equipment and spinning wheels. It later became clear that many of the graves belonged to women. Want a Norwegian Sweater? Click on this sidebar article to learn how to find one that is authentic. Sundbø describes the burial mounds to me on an overcast morning as summer is slipping into fall. We sit in her basement at a rough-hewn plank table, a fire crackling in the huge fireplace, the air redolent with damp wool, the floors strewn with rag rugs. There’s yet another spinning wheel stashed nearby, and the walls are decorated with display-quality tapestries. She shows me tiny rug samples she has made by hand-knotting spelsau wool in the same manner of Turkish carpets, and she’s theorizing about all the information embedded in ancient textile patterns that we don’t yet understand. She’s talking about the Icelandic sagas and the Eddas (old Norse mythological tales) and Ragnarök (in which the destruction and rebirth of the world is foretold). And she’s linking all this to etymological associations that may or may not mean that the ancients believed that weaving will be central to the resurrection of the world after the final battle of the gods. When the dog-whelk gland is first pressed to paper, it creates a yellow stain. After exposure to sunlight for about 15 minutes, the stain turns lavender; only after yarn is soaked in a solution of whelk glands and ammonia does the hue turn blue. She’s explaining that the nine-cross pattern in tapestries evokes a story about begging for silver and making the smith work for free. And she’s pointing out the striking similarity between a weaving fragment from an old Norwegian tablecloth and the ubiquitous QR codes we use today to identify objects and mail packages. Sarah Pollock has been senior editor at Mother Jones, editor-in-chief at Pacific Discovery, a staff writer for leading newspapers such as Long Island Newsday, and director of the journalism program at Mills College. Sarah now divides her time between northern California and Norway, where she spends summers in a cabin on the Otra River. Translation assistance for this article was provided by Asbjørn Moseidjord.